According to legends, a hummingbird carries important spiritual meaning. They are attributed for floating through the air outside of time so we see them as messengers from beyond. The Native American cultures portrayed hummingbirds as healers and carriers of light. They are helpers from The Spirit World who bring luck, joy, and love to those they approach. Certainly, hummingbirds have the ability to open our hearts and eyes to the wonders of the world. Here is some of the symbolism hummingbirds carry in our collective unconsciousness and the spiritual messages they potentially share! Because hummingbirds are the smallest of birds, they effortlessly fly and make acrobatic stunts. They easily fly up, down, backward, change direction in an instant or quickly shift from full speed to standing still. This ability reminds us to be adaptable to life. It urges us to be willing to step back, observe, look at things from a different viewpoint and shift into action when needed. Hummingbirds are very lightweight, they can weigh as light as a penny. This lightness reminds us to lighten up, release the weight of doubts, fears, and worries. Like hummingbirds, our spirits can hover and soar for long periods of time. When hummingbirds hover, they move their wings in figure eight pattern, a symbol for infinity. It teaches us that time is an illusion of the mind, to think beyond time, to heal the past and center our presence and awareness in the moment. Hummingbirds keep drinking nectars from flowers. They never tire searching for the sweetness of life. They teach us to do the same because life is, indeed, full of sweetness if we only know where to find it. With their long, narrow beaks and longer tongues, hummingbirds can get past the bitter exteriors of flowers to dive fully into the sweetness within. Obviously, this teaches us to go beyond appearances. On the surface, things or life may look bitter, but when we dig into the core, there lies the essence of it all. 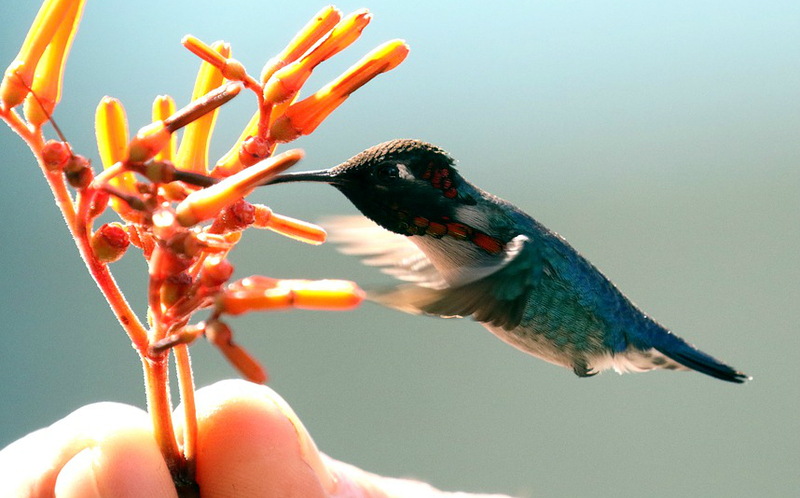 For hummingbirds, the nectar of life is one of the ultimate symbols of joy. They are filled with joy, hovering from flower to flower, living fully in the moment while following the path to what gives them joy. From this act, hummingbirds teach us that we have the power to be always joyful on our way to achieving our goals. That it is possible to stay fully present and joyful in all our undertakings. The soft hum of the hummingbird’s wings is quite distinct. It is said to carry a healing light and magical energy. This is a symbol for showing your soft hum to the world too no matter how insignificant you think it is. Being who you really are might be a healing energy for someone. So, if you see hummingbirds, pay attention to what it means. Calm your mind, open your heart and look within to tune in to the wisdom and wonderful gifts of light and presence the hummingbird gives.